Synopsis: Ease your worries about ground clearance! A lowered ride height is a must for any car used on the track or for performance street driving. The biggest down side to this modification is ground clearance. Speed bumps, pot holes or the occasional “Off Track” excursion can cause some serious damage to the underside of your car. 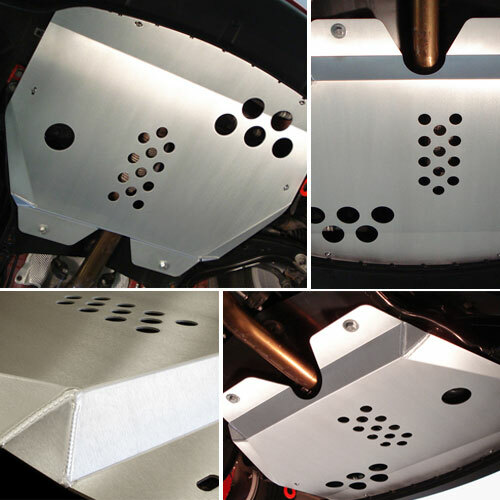 Rennline Aluminum Skid Plates have been designed to eliminate those concerns. Unlike many skid pans on the market, Rennline's undershields conceal the entire lower engine compartment and are formed so that no edges will get caught on objects when traveling forward, backwards or sideways. All of these skid pans are model-specific to give you the ultimate fit and protection. Hardware and installation instructions are included with each pan for a hassle-free install. Fits MANUAL transmission MINIs ONLY.